Spring washers feature a split in the washer, and are bent into a helical shape. This causes the washer to apply a spring force between the fasteners head and the fixing material that maintains the washer hard again the material, creating more friction and resistance to rotation. 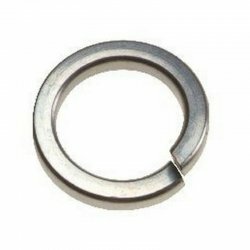 These spring washers ring-shaped, split at one point and bent into a helix. This shape means that the washer exerts a spring force between the fastener's head and the base item. The main purpose of the spring washer is to prevent loosening of the fastener by either movement or vibration. They are available with a square or rectangular section. These washers are made from stainless steel 304 (A2) or 316 (A4) for increased corrosion resistance. These washers are made from stainless steel 304 (A2) for increased corrosion resistance.